On March 21st, the first Scientific Roadmap for European Astrobiology has been published. This strategic landmark for European astrobiology has been produced through the European Commission-funded AstRoMap project (2013-2015). In putting this research roadmap document together, the 19 authors relied on the outcome and findings of the AstRoMap project as well as on wide community consultation and four disciplinary workshops organised between 2013 and 2014. 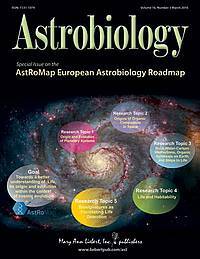 The AstRoMap European Astrobiology Roadmap consider astrobiology in a wide context: it is understood as the study of the origin, evolution, and distribution of life in the context of cosmic evolution; this includes habitability in the Solar System and beyond. This makes this roadmap a transdisciplinary document of relevance for many communities, from astronomers to planetary scientists and from atmospheric physicists to life scientists. While it addresses life beyond the Earth, topics it puts forward are also very relevant to life in Earth extreme environments and to the understanding of our evolving ecosystem. The AstRoMap Roadmap identifies five research topics, specifies several key scientific objectives for each topic, and suggests ways to achieve these objectives in a stepwise approach (in the short -within the next decade-, medium -within the next two decades-, and long -beyond 20 years- terms).